Spawns patches of Clay, Sand, and Dirt, within the Deep Dcean layer of boring gravel. If you link to this page and let me know somehow (comment or twitter @lothrazar), you can use this in a modpack. Letting you know that I'm using your mod in my modpack, Planar Traveler, as per your request. Notifying you that I'm using this mod in a semi-public modpack as per your request. Currently only myself and my friends are using it, but it can theoretically be accessed by anyone who receives the link to the pack. Is it possible to completely replace all gravel to sand at ocean floor and at beaches? This mod is awesome! 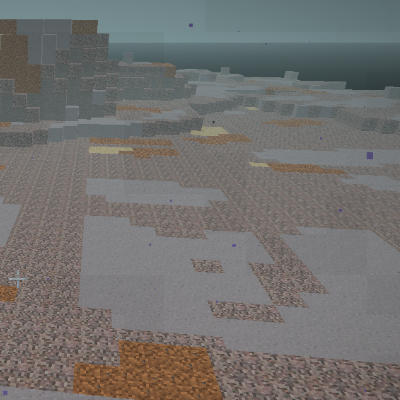 I even adjusted sand size in the config to biome size. But I also have a mod called Coral Reef, whose blocks being replaced by sand, mud, and dirt generated by your mod. So can you make a compatible patch for Coral Reef mod? typo. you wrote "Dcean" instead of Ocean in the first sentence. love your mod, i'm using it in my curse modpack cinnamon - thankyoooo! This is nice, as I hate the blandness of just gravel as far as the eye can see. Update the mod to 1.9.4/1.10 please!!! Better than the all gravel seabed! I swear this Notch guy must live far from the seven seas!! Can I spawn a real world deep ocean floor of mostly Sand with the occasional clay, dirt and gravel? Is that a challenge? Why, yes, yes it is! Cool. Why are the textures in the picture like that? Oh, yeah, I forgot that I use a texture pack that replaces the current gravel with the beta gravel texture, I will add some more screenshots with pure vanilla textures. Edit: i have added a new screenshot.